Thus far in her writing career, Naomi Novik has been a staunch advocate for the freedom and important liberty of writing fanfiction, right along with writing a successful series of books that pairs dragons and fierce battles of the Napoleonic War and the accompanying thorny politics (The series is entitled Termeraire, and if you haven’t read it, you really should!). For this novel, Naomi Novik ventures into the mythology and folklore of Eastern Europe, in an attempt to spin a new yarn, utilizing the Joseph Campbell monomyth trope for great effect. The question stands then for the type of novel Uprooted attempts to be is whether it is able to succeed in differentiating itself enough so that it stands out in a fairly overcrowded book market. In many ways, Uprooted succeeds in providing a more inventive, fresh take on the hero journey, surrounding a woman picked by a dragon to be her ward of sorts, and then be surprisingly trained by the reclusive Dragon himself. The story uses the dynamic of the relationship that forms between the dragon,a wise, experienced wizard, the naivety, who is the complete opposite of abundant, free-flowing creativity of the main female protagonist of the story, Agnieszka. The writing succeeds best, when their complex relationship is detailed with exacting, well-written prose that is never too superfluous or anemic; it is measured in a way that provides nuance and complexity to these characters without detracting from the flow of the story. Their interactions are so well-written, and their amorous tension is done with such lovely, vivid prose that never ventures into the purple patches. It shows that Naomi Novik excels with painting her female protagonists with sensitivity and care, specifically, and I loved that her female protagonist can have a romantic subplot without cutting herself off from her friendships with other women within the novel. Moreover, the plot concerns itself more than this fairly complicated romantic subplot, by providing a very interesting story that weaves a fresh take on the narrative of nature v. industry. We’ve seen this recurrent dichotomy within books like Lord of the Rings, where industry is painted with stark malevolence, compared to the intrinsic goodness of those that exist peacefully with nature, like the Ents that literally are enmeshed into nature itself, to those that can live alongside nature in a mutually-inclusive relationship, whereas the Orcs and the forces of evil are destructive, when it comes to facing nature, and they often are very avaricious, with respects to how they interact with nature. This same established dichotomy is deepened within Uprooted, in that the forces of industry (or the politic/feudal infrastructure of the kingdom) actually becomes monstrous, by being tainted by someone who feels deeply slighted by the world of humanity, but yet their deep-seated ire and rage are hardly remedied by being within the surrounding woods of the kingdom, so they in effect poison nature with the taint of their restive rage, and stewing vengeance over being so deeply hurt and betrayed by something that occurred in the human world. I have to be rather elusive with my wording here, as not to spoil any of the details of this story. But this relationship between nature/industry is still one in which humans bring some kind of corruption to nature itself (not the other way around), but nature can then be infused with the taint of humanity that has long existed in walled fortresses, apart from nature. Within Uprooted, nature like industry have the potential to be either moral,productive good, or amoral, destructive, parasitic evil. In many ways,the morality of Naomi Novik’s story, in contrast with how Lord of the Rings handles this nature v. industry dichotomy is that things are not nearly so black and white. But nonetheless, the same message is really told, provocatively by women, who play a very central role in this story,and that is the large difference between Lord of the Rings and Uprooted, in that women play a powerful role in striving to balance the forces of industry and nature, in a way that both can coexist, even if in a rather precarious way. And Naomi Novik does a masterful job weaving a tale of spells, adventure, monstrous figures (literally manifest by the “wronged” spirits taint on the essence of the woods). Nothing in Naomi Novik’s world is rigid, every character has a shade of good/evil, and this is what makes her story so compelling, in that its seemingly deceptive simplicity actually belies a story of depth- a new way of refashioning the story of industry v. nature, in a way that is progressive, while still maintaining some lore-ish (I did a Buffy right there, with the -ish colloquialism) roots in terms of paying fidelity to some tropes. Yet sometimes the story’s roots don’t reach deep enough, in that several of the battle scenes midway through the novel are rather tedious, overblown, and often they can become interminable at times. Sometimes this really detracts from an otherwise fairly cohesive, fascinating work that combines so many elements, and includes a fairly sobering reflection by the end, an almost bittersweet, though hopeful ending that reminds us all of our fundamental connection within the world we live in, and that we must take care to treat our own interior selves, as much as preserving/maintaining a close bond with the world around us. Meaning, we should be industrious and creative, in a way that brings peace. Almost ironically, this story’s main message rings with the truth of Naomi Novik’s own strong views on fanfiction, and how fans building new stories and worlds within an author’s work does not need to be destructive. In a sense, the rigidity of the Dragon, and his initial reproachful response to Agnieszka’s unconventional style of magic (works randomly, free of established spell sets and formulas), along with his reclusivity, acts as a commentary on the relationship between reader and writer. As a result, Naomi Novik feels that both must work in harmony to bring greater depth to a work of art. Authors should venture outside the insularity of their imaginations sometimes, and allow their fans to freely explore the work, and create responsible works that pay homage, with how fanart/fanfiction tends to extend the creative scope of a work. But the fans themselves must be respectful also, as an author and fans must reciprocate respect for each other in turn. 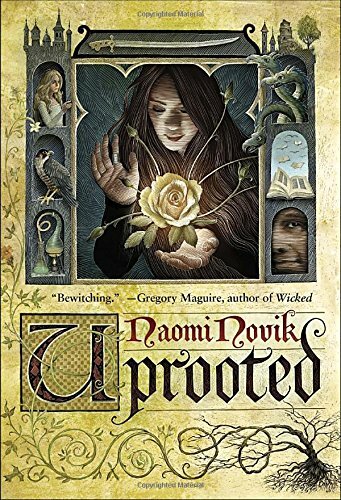 If you’re looking for something to read that has elements of the fantastical, along with a strident edge of fairytale awesomeness, you should definitely read Naomi Novik’s clever and exciting book Uprooted. You’ll most definitely feel uprooted from the world around you, when entering the mesmerizing world that Naomi Novik weaves so well. Thank you for a thoughtful, enjoyable review – and for highlighting the fact that Novik has produced another novel:). Himself and I both enjoy reading this author and it had escaped both of us that she has released another book. Her books are really excellent, I loved her Temaraire series as well. It’s awesome to see her branching out in this way. She is also a very nice person as well, having had the chance to meet her back in ’08. Leave me know when you’ve read it, I would love to hear your thoughts on the book.